In the name of Allaah, Most Merciful, the Bestower of Mercy. In response to the BENEFICIAL winter conference. 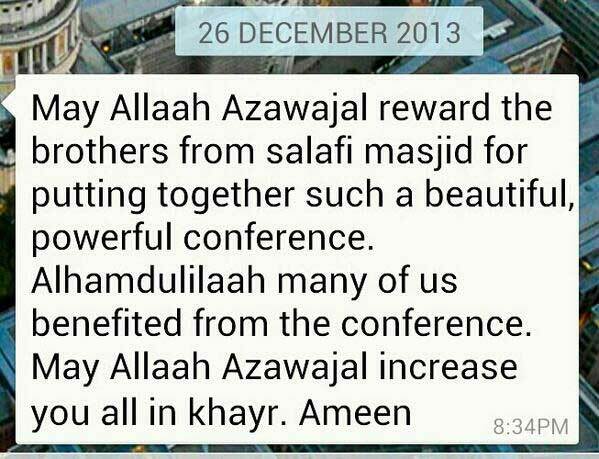 I have enjoyed the winter conference by Allaah. For some reason it hit me, and I remember everything so vividly. I liked how it advised parents as well as the youth to be steadfast – I really, really enjoyed it. I cannot emphazise how much it benefited me. Allah knows best! I came for the two days. And everyone had note pads and there was teenagers and young ones listening attentively. Wallaahi, the atmosphere was beautiful. We all gathered for one purpose: To seek knowledge with the duat. But one thing, i want is that it is not done on a christmas day. There was trouble and great difficulty getting to the conference, as there was no [bus] service. And by Allaah I would have walked from Handsworth to Small Heath by myself. 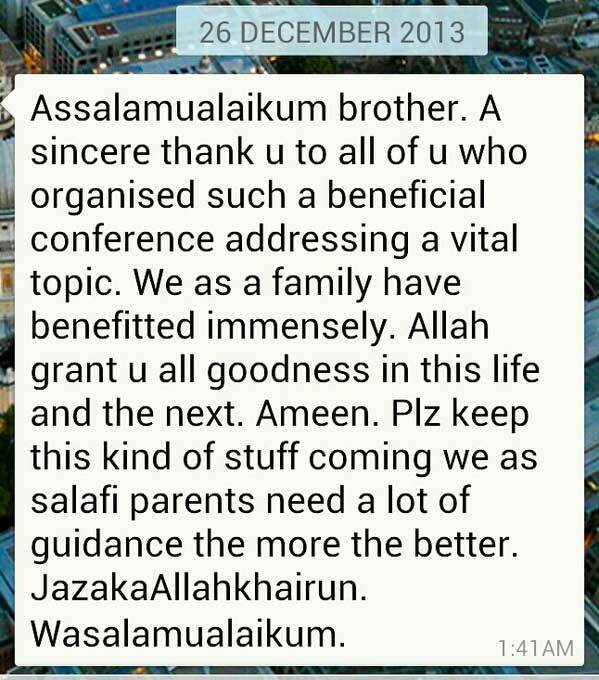 So In Shaa Allaah, have the conference done on a day where services work. Assalaamu alaikum. 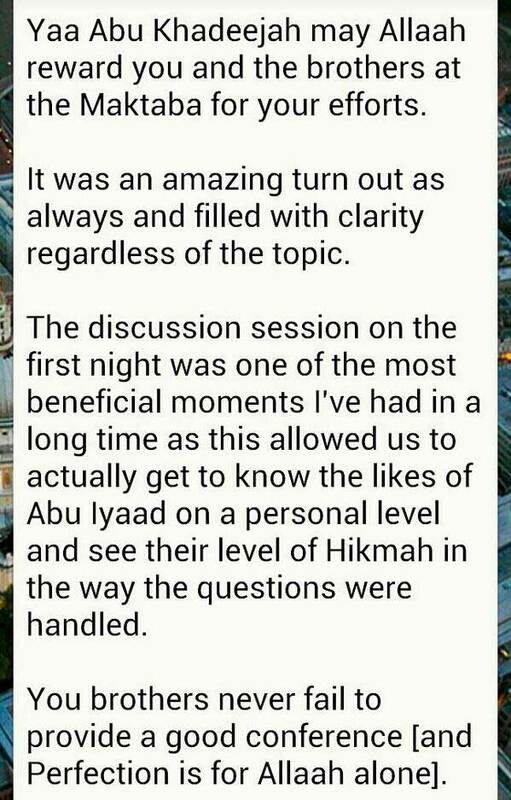 The conference was brilliant maasha’Allaah. Only thing was I sat in the mother and toddler rooms and the speakers were very quiet and it was difficult at times to hear the talks. 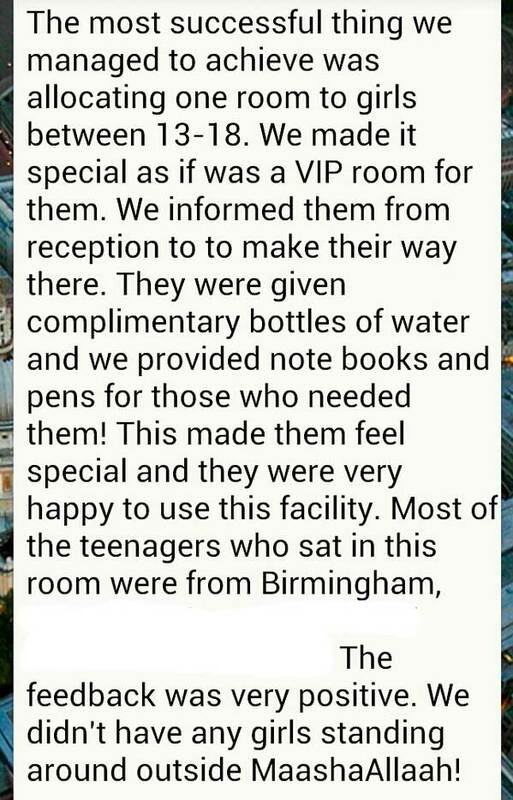 May Allaah reward the brothers for their effort and time and all the sisters, aameen. The conference been focused specifically on one topic for both days, was most beneficial indeed. I’m sure most parents like myself truly appreciated this as we are in need of this knowledge for our day to day responsibilities. I was able to attend live both days. Walhamdulillaah. I would like to add it was so much more well organised. The marquee being larger and carpeted made all difference for weather, felt clean which is important. The toilets were kept very clean due to signs put for parents accompanying their children (the signs on the white board could have been bigger more visible maybe in colour) as I noticed towards the end. I was in room 1, few of the talks the sound was low on speaker, allaahu a’lam if that was due to the brother moving away from microphone. Sisters do need reminding not to talk, so definitely next time the brother can announce to the sisters not to distract others. Jazakallaah khair. Assalam Alaikum. 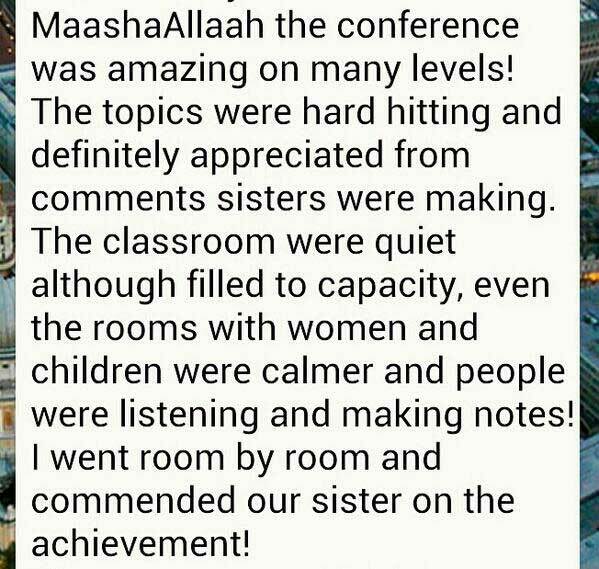 Masha Allah the conference was indeed very beneficial and Alhamdulilah I truly enjoyed it. It was my first ever, to attend a conference in UK, so I can’t really say how it was different from the previous ones. I attended in person the first day and then online the next day as my baby was unwell. I was amazed at how many people attended, so pleased to see the large numbers of Ahl us Sunnah, the smiles and bright faces of my sisters from up and down the UK and further, the gathering together, the moving closer to accommodate one more sisters in the room, the sharing of food, the spreading of salaam and the hugs everytime you came across a sister you know! Just the whole environment was such an eeman booster ukhti. Then ofcourse the beautiful lectures. Masha Allah so powerful. May Allah reward all the speakers and give us the ability to act upon what we learnt. The topics were very important for us as parents, who are struggling to raise our kids in darul-kufr in an era of so many challenges. The admonitions, the reminders, the practical examples, the details were all tremendous. Many of the points mentioned were known to us but the powerful delivery of the message has injected new energy which pushes us to work harder and better, walhamdulilah. I also loved the sister (I don’t know her name but she is the one who had the mic on the auction day at RedStone) who would keep a tab on the sisters and keep popping in the rooms and make sure there was no chatting and disruptions. Excellent, Masha Allah, making the whole environment towards learning and listening. This kind of gentle discipline is important ukhti because recently I attended a talk in London and the sisters were chatting so much that it was becoming hard to even hear the speaker. One thing my mother in law ,who is in her 60’s, found hard was to sit on the floor.. If in the future we could dedicate a small area for our elderly mothers and provide some chairs for them. These should be reserved solely for the elderly, maybe even reserved, that way we can only have limited spaces. 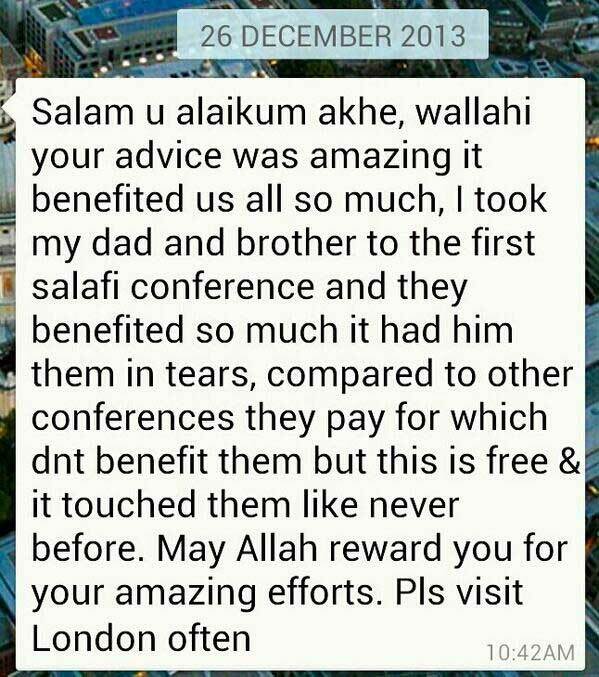 She came from Surrey to attend and it was her first ever at a salafi conference, but Masha Allah she loved it. She did listen online the next day in the comfort of the home but even the environment of the conference had such a huge impact on her eemaan and she left with a beautiful impression of the salafis. Ukhti, how come nobody was collecting donations? All in all, the conference was insha Allah a success. Everyone who attended, in person or online, young or old, brother or sister, took away immense benefit insha Allah. May Allah reward all those who were involved to make it a success. Can’t wait for the next one! Jazak Allahu Khairan, wasalam alaikum. Alhamdulillaah, maashaAllah. May Allah bless you all aameen. Was an absolutely lovely conference this year. Allahu Akbar! I don’t always attend in person (like to listen at home due to younger kids) but this time I went along. It seemed to be well organised. Was able to listen well. Children were happy in CKC kids club. That club is a blessing! maashaa’Allah. The duroos were the highlight! The topics were & ARE greatly needed & they were excellent advices. I think many the youth are struggling here, & families, & what we heard was what we needed. A wake up call. May Allah reward the du’aat with good, aameen. May we as the community take on the advices & implement them. Aameen. I don’t have any suggestions. Can’t think of any – but on whole, khair! BaarakAllahufeekum. I listened over the internet. 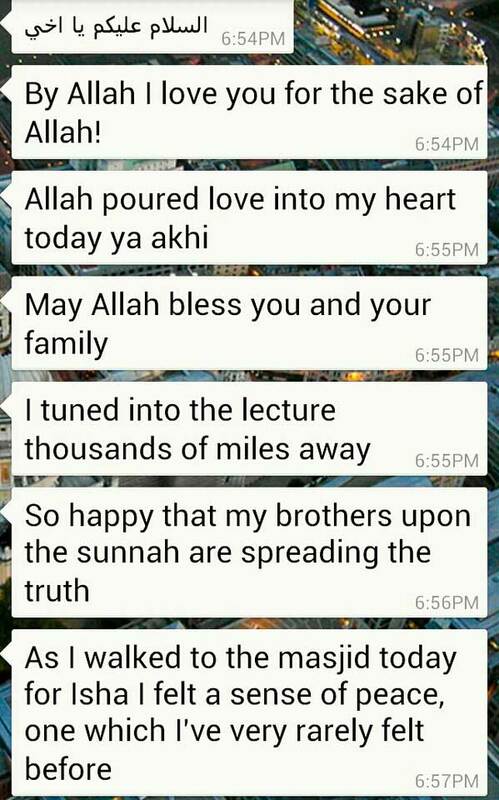 I especially enjoyed the brothers’ [talks], in shaa Allah, sincere and heartfelt advice. 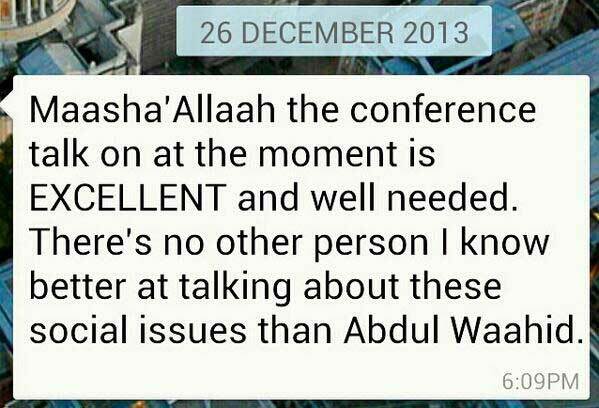 But this is not particular to this conference of course, ma shaa Allah. What was different about this conference was perhaps how the subject was something very relevant to our daily lives. Raising our kids! Something we struggle with and are in dire need of support and advice regarding. So may Allah reward our noble brothers and everyone who has aided them and always keep us and them firm upon the straight path, ameen! Assalaamu alaikum the conference was brilliant maa sha Allaah only thing was I sat in the mother and toddler rooms and the speakers were very quiet and it was difficult at times to hear the talks. Assalamu alaykum wa rahmatullahi wa barakatuh. This years conference was subhanAllaah beyond words… highlighting current issues and how to raise the next generation upon salafiyaah. Brought so many ideas and a lot of mistakes home which many of us make. Even my children Allaahumma baraak were behaved. Cant think of any future subjects I would like at the moment. May Allaah subhannah wa ta’ala preserve our noble brothers upon khair, piety and righteousness aameen. BaarakAllaahu feekum.